If you’ve read any of my blogs for the last 3 years, you’ll know that I spend a considerable amount of time demystifying hypnosis. So many people think clinical hypnosis with me will look like what they see in the movies: a mystical, goateed man on stage turning an unsuspecting audience member into a clucking chicken after a countdown. But you and I both know that’s ridiculous. 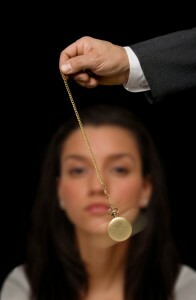 Hypnosis is not entertainment, it’s not mind-control, and it’s not hocus-pocus.But there’s another issue underneath that question that I’d like to address right here: is hypnosis dangerous? Whenever there’s mystery around anything, we assume that there’s some element of danger. A lot of people presume that since the hypnotist can use suggestions and surpass a patient’s conscious mind, that there can be some kind of nefarious controlling of the patient, but I can’t reiterate the fact enough that you never lose control. You don’t fall asleep nor do you turn into a mindless zombie. If something seems or feels off, you’ll never be in so vulnerable of a state to not realize that. And while any industry can have its bad eggs, hypnotists by and large take great responsibility with their hypnosis technique to ensure that any change is the positive kind requested by the patient. Please always ensure that your hypnotists is licensed, and that you’re going to someone certified by the National Guild of Hypnotists. For more information, please call the office at 212-599-3195. This entry was posted in hypnosis nyc and tagged hynosis by Dr. Errol Gluck. Bookmark the permalink.